I think by now we can come to the conclusion that Mr. George W. Bush is taking orders from higher authority which transcends the logic and thinking of mere mortals like you and I. This Iraqi plan (Full Text of the address) to feed more cannon fodder to the meat-mangler of sectarian violence in Baghdad and other volatile regions of Iraqi seems to have the support nobody but Bush and the mortals elevated to the status of Cabinet or advisor with the occasional legislator and commentator to boot. 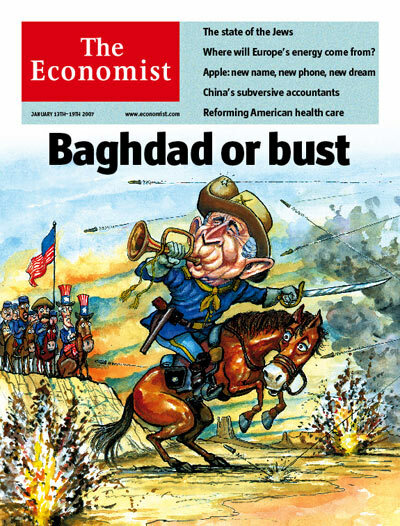 Like the cover of this week’s Economist – Baghdad or Bust – Mr, Bush might be unto something, a conviction that goes beyond nominal reason that the confidence that exudes beyond every contrary advice leaves us almost saying, this might work and maybe it would. After the report of those eminent persons in the Iraq Study Group (ISG) which gave us a feeling that some reason has come into this Iraqi debacle, Mr. Bush has taken a completely opposite view of that report. Basically, by redeploying everyone of importance in the Iraq venture before the ISG report be they military commanders, ambassadors, intelligence chiefs or personal advisors and in the process created a new “Team Iraq”. One thing is clear; many of these newbies have been long in their careers and are hardly driven by ideology. One might however wonder if this quality allows the primacy of the Commander-in-Chief to hold sway over objective analysis and hence lead to less opposition the President’s resolution on these matters. We have been told that Iran and Syria are contributors by ways and means to the instability in Iraq, the ISG was quite particular in emphasising the need to engage Iran and Syria diplomatically by milking their relevance to Middle-East stability and clearly highlighting their compromised interests if they are uncooperative. It would appear, this is not a path that the President would adopt, his Secretary of State is now in the Middle-East speaking to the wrong people in the hope that ignoring and isolating Iran and Syria would bring the necessary peace dividends to Iraq, well, and she must also know something we do not. Rather than engage with Iran, a raid was conducted on the Iranian Consulate in Irbil, Northern Iraq by American troops; this escalation in reckless militancy cannot have been done without the knowledge of the president, considering the possible consequences of this action. And as we are still being fed the view that Iran is busy developing military nuclear capability, we must not forget that Seymour Hersh reported in November 2006 that a secret CIA report indicated that there was “no proof” – their qualification - that Iran is developing nuclear arms in tandem with the civilian developments that have been declared to the International Atomic Energy Agency. It could be that Israel might decide to launch a nuclear raid on Iranian nuclear infrastructure though denial might as well have an element of surprise to it. This leaves us in a bit of a quandary, the possibility of a “U-See 3 EyeS” (US, Iran, Iraq, Israel, Syria) eye sore of the carnage of war that involves the United States, Iraq, Iran, Israel and Syria – maybe, 2007 is really the year of Armageddon – again – Mr. Bush probably knows more about this than we could every phantom.